Powered by an Intel® Xeon® D processor, the powerful enterprise-class TES-3085U is open for two operating systems – either the FreeBSD-based QES or Linux-based QTS. While QES supports ZFS for the utmost reliability and allows near-limitless snapshots, block-level data deduplication and real-time data compression, QTS features Qtier Technology, SSD cache, and an abundance of value-added apps to realize storage efficiency and diverse usage applications. The TES-3085U gives the flexibility to choose from two operating systems, enabling businesses to deploy proper operating systems on multiple TES-3085U based on their needs and goals in different stages. The TES-3085U is especially useful for providing a speedy all-flash storage solution that offers up to 24 disk bays and 6 dedicated SSDs bays for caching. Note: To change the NAS operating system after completing setup, it is necessary to re-initialize the hard disks and delete all stored data. A remote backup is required before switching the NAS operating system. Powered by an advanced 14nm Intel® Xeon® D 64-bit SoC processor with an integrated PCH, up to 128GB DDR4 ECC RDIMM RAM / 64GB DDR4 non-ECC UDIMM RAM, and with two built-in 10GbE SFP+ ports, the 12Gb/s SAS-enabled TES-3085U delivers outstanding performance for data transmission and applications. With a thermal design power of only 20-65W, the TES-3085U fulfills demands for both performance and energy saving. Note: TES-3085U requires at least 32GB RAM for running QES operating system. 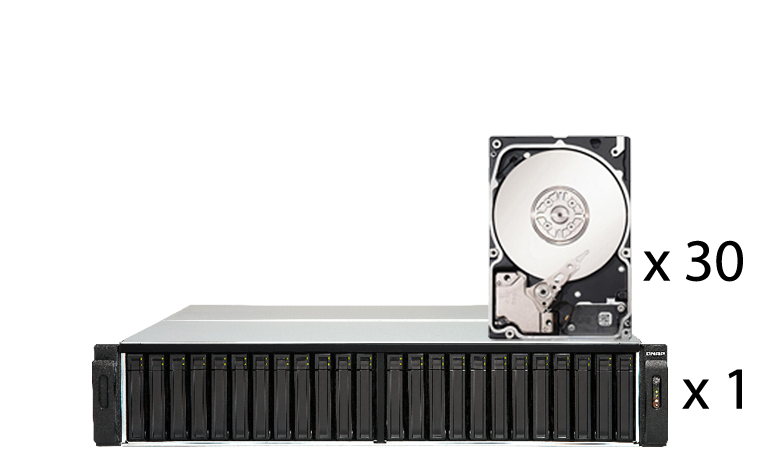 Download the QNAP TES-x85U Series Datasheet (PDF).